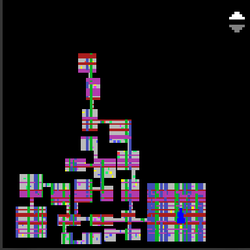 This dungeon is made up of moving floors, lots of dead ends and monsters that are just annoying but not very dangerous. Well, except for the occasional Purple Sprite Gods and of course the boss Limon. Once you reach the boss room you have to waken the boss. Move in on Limon and shoot the bugger one or 2 times, he will fire 7 shot groups, when done he will throw out 8 turrets forming a large box with a smaller box inside. These turrets can hurt you and kill you pretty quickly even a potted character if you are not watching your health. The purple Sprite Gods are a decent source of ATT so its a good idea to take the time and search the entire Sprite World for the purple Sprites and collect the ATT if they are giving it out. Once you wake Limon a melee, dagger and Ninja class will have to move in and take the fight to Limon. When Limon releases the turrets in the corners, he stops moving and stays in the middle of the box. Shoot at him and dodge his attacks when he is not vulnerable. A bow class can stand a bit farther back having more time to dodge. A Staff or Wand class can stand between the turret lines shooting safely at Limon, no dodging required. If you have not killed Limon by the time the turrets disappear then shoot Limon once or twice and move back to safety and repeat the process. Your max DEF allows your character to run up and harass Limon while he shoots off his 7 shots and forms up the two turret boxes. Once the turrets pop up stay inside the boxes shooting and dodging killing him off. Sometimes you may have to repeat. Rogue - cloak your way to the boss. If you have Plane Walker, teleport across to the next rooms on your way to boss. Trickster - teleport your way to the boss, great for doing Sprites fast. Sorcerer - use your ability to clear the little minions as you move forward. Clearing the minions removes the ones that cast slow.